Builder of Stringed instruments & maintenance/repair of stringed instruments. Maker of Barebones Cajon's. Why the name “Barebones Folk Instruments”, you ask? My nickname is “Bones”, I build great sounding, reliable instruments without the fancy inlays, sound-hole rosettes, bindings etc. Decorative enhancement does not necessarily increase sound quality, only the price. With a passion for Tenor Banjos, I also re-furbish old instruments and re-building others into hybrid, short scale Tenor banjos, Banjo Ukes' and 8 string Banjos. My "Crown" and "Trad" series stringed models can be obtained in Octave Mandolin, Guitar, Mandolin & Ukulele, often available ex- our showroom or special order. Select woods available for special orders. Custom Instruments made to order. Percussion Beat Boxes also available. *Crown Octave Mandolins for sale. *Acoustic and solid body Electric Mandolins. *Crown Ukuleles - available in Tenor or Baritone scale. * "Trad" Ukuleles available in Tenor, Baritone, Concert or Soprano scale . *Hybrid Tenor Banjo’s and Banjo Ukes’ for sale..... or I can convert your existing one. Also models fitted with an internal, bass kick pedal. *Builder of Stringed Instruments, basic maintenance/repair of fretted stringed instruments –subject to inspection. *Concept instruments (weird stuff you can’t buy)...Ask me. 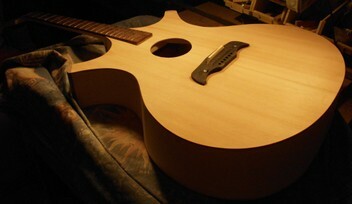 *Please view/see photos of other instruments I have built. “THE SCREAMIN" LARKINS” band, 4-5 piece - bush folk rock/Irish. Acoustic & Electric Guitars, Fiddle, Banjo, Mandolin, Bodhran, Pipes and Whistles. Bones helped me source and fit new tuning pegs on my mandolin and also made a custom feedback buster for an unusual shaped sound hole on my guitar, all the while sharing great stories and friendly banter. I loved playing the tenor Mandolins in his workshop too! They sound amazing and each one has it's own personality. A great guy to hang out with! I'll be back :) Thank you Bones! Graham "Bones" Hurlock: Great to meet you Karen, I'll look forward to your next visit. I couldn't be happier with my new tenor banjo and the incredible service provided by Bones. He went absolutely above and beyond in restoring an old Slingerland to create an instrument that plays superbly. Bones is a first class craftsman with a rare integrity who truly cares about his instruments and his customers. An excellent and honest maker and repairman who I would recommend to anyone. Thanks a million Bones! Graham "Bones" Hurlock: Glad we could restore it for you. Cheers, Bones. Graham "Bones" Hurlock: Great to meet you Tony, happy to be of help too. Graham "Bones" Hurlock: I'm glad I could help out, I love working on old banjos and getting them going again.. thanks for your custom and best regards ... Bones. Graham listened and watched me bend strings to pull into pitch... up the fret board. I then I left my expensive hand made instrument with him. Graham came back with suggestions and between us we fixed those damn intonation problems. I recommend Graham to anyone having issues with their stringed instruments. Graham "Bones" Hurlock: Cheers, happy that I was able to help with the issues and get that uke back to sounding great. Excellent Work! restored my flatmate's broken guitar! very skillful and great attention to the detail! Sorry for very late review! Graham is very very nice person! Top quality work and super friendly and helpful. Cares about his customers and the integrity of his work. Absolutely recommend! Graham "Bones" Hurlock: Happy to have been of service. Thank you for your custom. Graham "Bones" Hurlock: Thank you for your custom Jon, I love working on those old banjos and am pleased that we could get it playable again for you. I love my new Beautiful ukulele!! Very good quality with solid wood and delicate work. Thank you very much for being patient and nice to my fussy requests. He completely understood what I wanted with a quick reply to solve the problems. Every time when I play the ukulele that you made, I can tell how you love the musical instrument. It will be my last ukulele! Graham "Bones" Hurlock: Thank you for your kind words and for being a great customer. I cannot begin to sing the well deserved praises of Graham's personable, informative, creative, knowledgeable and empathetic rapport he quickly established in the tireless exchange of emails that transpired in allowing me to be a BIG part of the creative making of what now has turned out to be my now handsome, technically and aesthetically beautifully crafted one of a kind concert ukulele! The technical precision and balance of woods used is just amazing. Genuine thanks just doesn't seem enough. Graham "Bones" Hurlock: Thank you Dee, It's been a pleasure. I'm glad your goddaughter liked the Cajon too. Cajon with bass pedal....Used the drum on Sunday.... folks loved it!! Mic'd up really nicely and sound was great... easy to use... Awesome drum!! Graham "Bones" Hurlock: Thank you for your feedback Andrew. I'm glad it was a hit. Cheers for your custom. Hi there, i was just wondering if you were selling any more of the cajon's? was interesting in buying one, and where would pick up be? would be great to hear back from you thanks! Graham "Bones" Hurlock: Thank you, will contact you. Sorry but someone else got in before you when I put up the buy now..
We've recently bought two of Bones's phoenix banjos - a tenor and a tenor banjo uke. Really respect the craftsmanship and the passion that goes into these instruments, they're both a joy to play. Bones is always happy to chat about what he's up to and take the time to have a look at an instrument - a real craftsman and a great guy to deal with. Graham "Bones" Hurlock: Thank you Murray. I'm glad it worked out. Great guitar too. Recently visited Graham [Bones] with a collection of old ukes that needed sorting. Thanks Graham for generously giving your time and expertise to get things fixed. I was very impressed by the quality and sound of your hand made instruments. Thanks again Graham. Regards Chris. As a left handed instrument player, access to affordable quality instruments (other than guitars) was once an issue for me - but no longer. If customer satisfaction is measured by repeat business, then the only thing I need to add is that since 2005, I have become the owner of THREE Barebones instruments, and I wouldn't willingly part with any of them. What a talented man beautiful craftsmanship and very happy with my new tenor banjo uke. Need to get practicing to give it justice it deserves thankyou so much. Have just taken delivery of a brand new Crown Royale Tenor Guitar/O.Mandola specially made for me by Bones. This Master Craftsman assisted with selecting appropriate wood(s) and constructed a stunning instrument that I am over the moon with. Cannot believe the glorious sound that just 'booms' at you. Hopefully some pix will be put up to drool over. I highly recommend this outstanding Luthier, whether repairing or creating magic. You will not be disapointed. Grateful thanks, Bones. Jack. Graham "Bones" Hurlock: It turned out just as we planned, Jack. A awesome sounding result, let alone the select woods, stunning all round.... I'm as pleased as you are, thank you.